Ooh, I love this series! 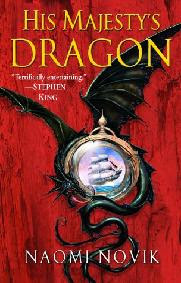 Having enjoyed both the Master and Commander series and...okay, not Pern because I never read it, but lots and lots of other dragon books, starting with Patricia Wrede's Dealing with Dragons books in fifth grade, I guess I was a perfect fit, but I really love her writing! The series just gets better as it goes--I think the most recent one might be my favorite. I liked Laurence from the start, I'll admit (what can I say, I'm a sucker for über-responsible, kind of boring guys), but I do think he really grows as a character. I still love Temeraire best, though! And this is a series I've been meaning to read for ages. People I trust keep recommending it so highly. Thanks for the great review! Sounds mahvelous. Normally I'm not a dragon person (although Robin Hobbs is workin' on me), but combining it with Regency England makes it irrestible. Oops! I meant irresistible, of course! Another fan of this series! I am seriously excited about the next Temeraire book which is due out very soon, after a very long wait. In this first book in the series, I did find Laurence a little cloying, particularly in the way he kept on calling Temeraire 'my dear', but it was a small annoyance in an otherwise very readable novel.